NASHVILLE, Tenn. – It was a substantial night for Cooper Webb and the Red Bull KTM Factory Racing Team as the North Carolina native extended his 450SX points lead to 21 with a podium finish at Round 14 of the AMA Supercross Championship in Nashville, Tennessee. 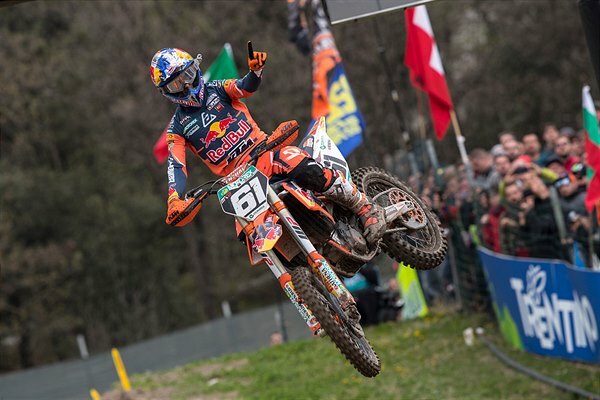 His teammate, Marvin Musquin, made the best out of a tough night by salvaging sixth overall after battling back from a crash early on. Rocky Mountain ATV/MC – WPS – FLY – KTM’s Blake Baggett put forth an impressive performance on Saturday, battling his way to a second-place finish in the 450SX class to give KTM a double-podium finish at the inaugural Nashville SX. Webb had a solid start to the evening as he finished second in 450SX Heat 1 to secure a favorable gate position heading into the Main Event. As the gate dropped for the main, Webb powered his KTM 450 SX-F FACTORY EDITION to the holeshot and early lead. He led for the first eight laps before dropping into the second-place position. As the race wore on, Webb found himself engaged in battle for second with KTM-mounted Blake Baggett. Baggett eventually made the move around Webb and he charged his way to the finish, capturing third overall and banking points toward his quest for a career-first 450SX title. Musquin had a great start to the day in Nashville as he claimed the second-place qualifying position in the 450SX class. He lined up in 450SX Heat 1 where he battled through the chaos to take the early lead in the race. The race was red flagged early on and after the restart Musquin ran into a few issues that ultimately set him back to claim an eighth-place transfer into the Main Event. As the gate dropped for the Main Event, Musquin put himself into second place where he battled just behind teammate Webb early on. As he was positioning himself for a pass into the lead, Musquin hit a square edge in the whoop section and went down, causing him to drop back to 20th on lap two. He made a big charge through the pack to ultimately climb his way up to sixth, claiming valuable points in the championship chase. Troy Lee Designs/Red Bull/KTM Factory Racing’s Mitchell Falk got off to an incredible start in the 250SX Main Event as he powered his KTM 250 SX-F into second early on. He maintained the second-place position for the first half of the race before shuffling back to a top-five running. Falk ultimately finished ninth in only his second race back from injury.